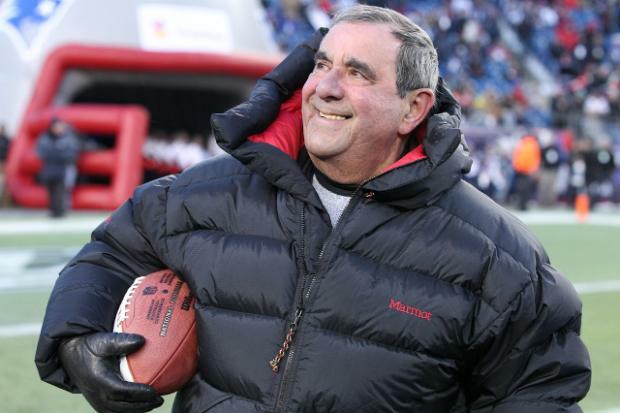 For 38 years, Gil Santos was the radio voice of weekday sports, the man New Englanders counted on in the morning for the scores and the details of yesterday’s games. He’s also been the voice of the New England Patriots for three decades, and he still calls those football contests with unmatched skill and a deep understanding of the complexities of the game. Gil Santos was the morning sports anchor for “The WBZ Morning News” broadcast on WBZ NewsRadio 1030 AM weekdays from 5:00 A.M. to 10:00 A.M. until he retired this year. Santos was ﬁrst heard on WBZ Radio in 1966 as the announcer for the New England Patriots and Boston College football. He became a full-time member of the WBZ Radio team in 1971 as the station’s morning sportscaster. Prior to working at WBZ Radio, Santos worked at WBSM and WNBH Radio in New Bedford, Massachusetts and WSAR and WALE Radio in Fall River, Massachusetts from 1959 to 1971. In addition to his work at WBZ, Santos was the voice of the New England Patriots from 1966 to 1979, and announced Boston College football for 13 years on radio and for three years on television. In 1990, he resumed announcing New England Patriots football games for WBZ Radio and is now heard on Inﬁnity Radio sister station WBCN, which now broadcasts the Patriots games. In addition Santos has done play-by-play for New England Teamen soccer, Providence College basketball, Brown University football, Penn State football, CBS-TV’s NFL football, ABC-TV and Radio football, ABC’s broadcasts of the 1984 Olympics and Big East TV basketball. Thoughout his career, Santos has been honored with numerous awards including a New England Emmy in 1978 for Boston College vs. Stanford Play-by-Play, four Massachusetts Sportscaster of the Year Awards, 25 Associated Press Best Massachusetts Play-by-Play Awards, four United Press International Tom Phillips Awards for Best Sports Coverage for the Boston Marathon, a UPI Best New England Sportscaster Award, and two UPI National Awards for Best Play-by-Play and Sports Reading. He was inducted into The Sports Museum Hall of Fame in 2004 with a Legacy Award and the Fairhaven High School Hall of Fame in 1996. A New England native, Santos was born in Acushnet, Massachusetts and grew up in neighboring Fairhaven. He attended Southeastern Massachusetts University (now University of Massachusetts, Dartmouth) and is a graduate of the New England Broadcast School. When he is not on the air at WBZ NewsRadio, Santos works with the Multiple Sclerosis Society and has done work with the Easter Seals organization. He also served in the United States Army during the Vietnam War. Santos lives in the Greater Boston area with his wife. They have two children. BOSTON (AP) -The ﬁrst contract sportscaster Gil Santos signed with WBZ radio was for 13 weeks. If they liked him, they said, they’d keep him. Santos is retiring from the station after a 38-year run that covered six Boston Celtics NBA championships, three New England Patriots Super Bowl wins, two Boston Red Sox World Series crowns, world record-setting Boston Marathon ﬁnishes and two Boston Bruins Stanley Cup titles. “I have been a lucky guy,” he said in summing up his career. Santos has spent a half-century in broadcasting during which his silky, deep voice became a comforting sound to generations of New England sports fans, both through his morning reports on the radio and as the play-by-play voice of the Patriots, a job he will continue after his retirement Friday. He’ll continue to do the Patriots’ games on WBZ’s sister station, WBCN-FM, because play-by-play is what he loves most. He calls the Patriots 20-17 Super Bowl win over the St. Louis Rams in New Orleans in 2002 the highlight of his career. Santos, who’s also been the radio voice of Boston College and Penn State football, did television broadcasts for the NBA’s Boston Celtics during the Larry Bird era in the 1980s when the team won three championships. But on television, you’re talking about a game the viewers can already see. Right up to his ﬁnal day at WBZ, Santos wrote his scripts on yellow paper using a vintage 1950s typewriter. Yet he also embraced technology, using the Internet to prepare for upcoming Patriots games by reading as much as possible on the team’s opponent. His familiar voice made him the radio station’s biggest celebrity. The Fairhaven native’s professional career began in 1959 when he was hired by WNBH-AM in New Bedford to be a disc jockey and play-by-play man for local high school football and basketball broadcasts. Santos hadn’t even ﬁnished college, but he landed the only job he’d ever wanted since he was 10 years old and listened to the Rose Bowl on New Year’s Day. Santos plans on pretty much doing nothing in February. He’ll eventually seek some part-time work, and continue to do commercial voiceovers. He’ll still watch sports, but now it will be his grandson Jacob’s hockey games, and granddaughter Hannah’s softball games. He’s looking forward to staying up past 8 p.m. with Roberta, his wife of 48 years. “But we’ll never replace him,” said programming director Peter Casey.